Dictionary.com defines the noun as: a supportive system of sharing information and services among individuals and groups having a common interest and the verb as: to cultivate people who can be helpful to one professionally, especially in finding employment or moving to a higher position. I take it a step further by merging the two definitions in the forming of FOCM Networking. This is a site (system) for sharing information and services among individuals who have a diverse range of interests for the purpose of helping each other more than just professionally, but also socially and financially. While attending SCOPE in mid-February in Orlando, I had the good fortune of welcoming Marie Perrone into FOCM. I had met Marie several years before via an introduction by long-time FOCM member, friend and former co-worker, Deb Nichols. It took so long for Marie to get her card due to some strange, but ultimately explainable issues in the background check that is run on all FOCM member candidates. The joy of receiving her card and the overwhelming relief to have resolved the items of her past is quite evident in the photo of this memorable event. On a warm, pleasant evening in October, the 1st day of the month to be precise, a significant event in FOCM history occurred; 4 new members received their cards. I was in the RTP area to attend the Arena International Clinical Trial Supply Southeast meeting and hosted a FOCM networking event at the Sheraton Imperial Lobby Bar. Attending that night were long time* members as well as first timers+. As best I can recall, the following people were there: Michael Williams*, Kris Gustafson*, Mike Burrows*, Rosina Pavia*, Paul Oldfield*, Tim Sauls*, David Holland, Carolyn Waff+, Lauren Sherwood, Israel Bocanegra+, Shae Wilkins* (traveled the farthest) . Receiving their membership cards were: Lauren Sherwood, Carolyn Waff, David Holland and Israel Bocanegra. As you can expect, emotions ran high during the card ceremony, with many people wiping tears from their eyes. The look of sheer joy on their faces the moment they realized they’d completed the sometimes long, sometimes short, but neverthless arduous and rigorous initiation process. Am helping a FOCM member find a candidate for the position described below. Additional information: basically need a current/recent oncology nurse or NP that is also good at knowing when data regarding patient volumes from EMR queries are likely inaccurate. It’s a key role that is critical to our meeting our deliverables… I think the perfect person has that oncology nursing background, but maybe left 2-3 years ago to join one of the CROs as a CRA or PM. Utilize knowledge of oncology patient care to support proposal development and clinical trials via thorough curation, analysis, and interpretation of EMR data housed in data warehouse. 4. Review medical records of patients identified by data queries as likely matches to a clinical research, and determine eligibility. 5. Maintain and manage “watch list” of those patients that are not currently eligible but may be in the future based on disease progression, resolved comorbidities, etc., to ensure timely enrollment when appropriate. 9. Handle other duties as assigned. • Functional knowledge of clinical research workflow and regulations. • Ability to quickly learn new software applications. • Strong organizational skills, including ability to manage multiple deliverables across multiple projects. • Excellent office productivity skills, especially with MS Word and Excel, as well as strong familiarity with clinical trials management software. • Ability to complete tasks independently, accurately, and within compressed timelines. Day shift with standard working hours (8AM – 5 PM); corporate office and/or home office environment with regular computer and phone usage. Minimal travel expected (less than 5%) after initial training/onboarding. This position may have direct reports depending on company growth and needs. The DIA 2019 Call-for-Abstracts is now OPEN!! DIA 2019 will be in San Diego, getting an abstract approved is a great way to get to attend. The registration fee is significantly reduced for those who present content. At the site is also the abstract guidelines and categories. The submission period is open from August 1 – September 12. 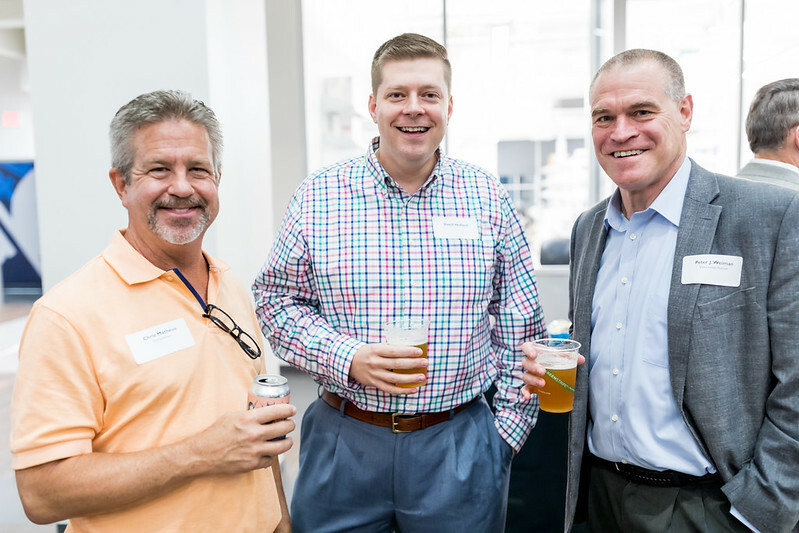 LaunchBio (LaunchBio) holds events on the first Thursday of the month in Durham, NC. They are held in the Chesterfield Building in the downtown area. The building was formerly a cigarette manufacturing building. It has now been converted and there is incubator lab space for drug discovery and development. It is a great opportunity for networking with people involved in the clinical research industry. Here I am enjoying a Durty Bull Lager beer and conversation with Peter Weiman and David Holland (they’re drinking the IPA that was being served). FOCM was busy before and at the DIA convention in Boston in June. FOCM along with Zymewire, Investigator Support Services, Kwipped and DataMatrix sponsored the 2nd annual Sunday night networking event before DIA exhibits opened. In the exhibit hall, FOCM gave its seal of approval to several vendors, assisTek being one. Unfortunately, the Arizona State Sun Devil hand sign snuck into the picture. In the shadow on the table, it appears to be a weapon of some kind. At the recent annual Drug Information Association (DIA) meeting held in Boston last month, two outstanding individuals completed the grueling probationary period, thorough background checks and initiation process. Please join me in welcoming Andrew Suri and Megan Carson to FOCM. As others who have received their membership cards, the ceremony itself can be emotionally draining. This was no exception, the sheer joy on their faces tells the story. Andrew is Director of Business Development for Clinogix. Megan is Assistant Project Manager at assisTek. A dues-paying FOCM Network member, Carrie Gallagher has requested the assistance of the network in connecting her son, Patrick Gallagher to opportunities of employment in the Raleigh-Durham area. The strength, breadth and depth of the FOCM network to help in this endeavor is being sought out. Patrick wants to get into the video game industry and has recently applied at Red Storm Entertainment, Boss Keys and Epic Games. For FOCM Members in the Raleigh/Durham area: does anyone know someone at these or other video game industry companies that might be willing to help Patrick get an informational interview/meeting. He’s just looking to speak with someone and knows that the rest is up to him. Patrick has taken classes in scientific and technical visualization, game art and design, is proficient in 3DS Max and builds his own computers. He has some coding experience but isn’t certified just yet. Patrick has worked continuously since he was 16. He is hard working, smart, and nice (his mother’s words and I have met him and agree with her). He’s done very well at every job he has held; always given more responsibility and is well liked by his colleagues. He is ready to move from a job to a career. It was a bitterly cold and snowy night that caused all but the bravest souls to stay in their warm homes. Only a select few dared to venture out into the third major winter storm in March. FOCM members are nothing if not brave, courageous, oh and, thirsty, let’s not forget that. So there we were on March 12, had previously arranged to have this event at a location which will now remain nameless since they closed and didn’t let me know. A quick decision was needed and made. With no time to spare a note was sent out stating we would meet at Mez. One of the top clinical research central Labs is looking for an experienced Project Manager in the US. The position can be located remotely.